This would be funny if people weren’t actually eating this. (Okay, it’s still pretty funny). As you may know, some fast food joints allow you to order “off-menu” and get creative with their offerings. In-N-Out is probably best known, ironically, for their secret offerings. Now, there’s a new one that’s come onto the scene. 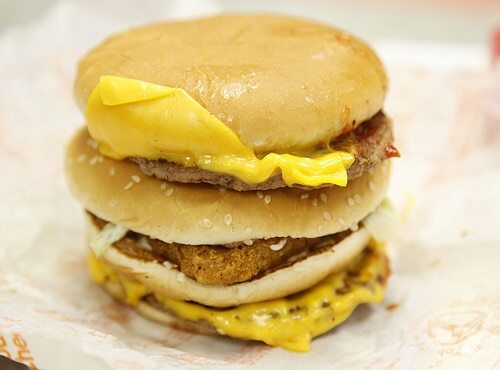 Ladies and gentlemen, I give you: The McGangBang. It’s a whole McChicken Sandwich shoved inside their Double Cheeseburger. Check out the in-depth (and definitely funny) chronicle on Eat Me Daily, complete with their own research, videos, and anecdotes of actually ordering this monster by name. Of course, I’m not condoning the sandwich (or the offensive name). In fact, I’m going to do the math and give you the nutrition information. If actually speaking the name out loud isn’t enough to keep you from walking into a McDonald’s and ordering one, hopefully the nutrition information will convince you to refrain. 800 cal, 14g sat fat, 1.5g trans fat, 39g total fat, 115mg cholesterol, 1,980mg sodium, 74g carbohydrates, 4g fiber, 12g sugars, 39g protein. For a 2,000 calorie-a-day diet, that’s about 40% of your calories, 69% of your max daily intake of saturated fat, 75% of your trans fat max, 60% of your day’s total fat, 37% of your cholesterol, 82% of your sodium, 24% of your carbs, 11% of your fiber, and somewhere around 65% of your protein. lololol. i know someone who will eat 2 of those AND a large fry and drink. thats horrible. This looks so good! I have had this once but not enough.